OI President Mark Shriver challenged us to continue to discuss, examine, pilot and report on recommended changes based on this workshop and any follow-up that we take within our District. Here is your chance to add your suggestions ... we invite you to read both documents and record your comments below. What an great convention. We had 98 members representing 18 clubs from across the District. We missed those of you who couldn’t come and promise to focus on what we can do to help you. We have to thank Convention Chair Dennis Farnham (Bozeman Breakfast) and his team for a fantastic job organizing and running this year's Convention. As promised, Dennis was able to keep the rain away until the day after the convention closed. OI President Mark Shriver did a wonderful job; he seemed to be involved in everything and I think talked to every single member there. The Bozeman Breakfast club hosted a 2 hour workshop presentation/open discussion event that focused on OI Renewal from Top to Bottom. You can read and comment on the reports that came out from this process. This review will proceed and committees will be formed very soon. I will Chair this. I am asking all members to commit yourself to finish our year strong so that we will be, for the fifth consecutive year, a Distinguished District. That will entail going the extra mile to help this happen. Finishing strong for our term means starting strong for Governor-Designate Tim’s year and on into Governor-Elect Ted Huber’s year. Do whatever you can to make your club Honor. That is the overall guide to measure success. It also encompasses the growth that we need which is about 140 new regular or FOO members and 1- 25 plus member club or 2 pilot clubs. Break it down and we are close. Clubs do not need to cut membership until October 1st. That will help us reach our goal for 2009-10 and clubs will not be penalized for cuts made on October 1st (we will provide more details on that in a few days). Please do your own share, help your club members too, help your zone and help other clubs throughout the District. Get a sense of urgency.it’s the last lap in our relay race so do it now! 7:00 pm Dinner followed by a program and past president reports. Table Wine and cash bar. Beef and Chicken Selections –Home-style serving. Please add you congratulations, comments, or questions in our Comments area below. For those who are not aware, Past Gov Bert recently underwent heart replacement surgery and is now recovering. Update: Bert has been released from hospital and is home resting. We have set up a Facebook discussion group where you can extend him best wishes. Past Gov Keivin Wallace will ensure that your comments are delivered to Bert once he can receive visitors. I'm pleased to advise that I have been able to update the "Members" page so that the forms links work and links to CPA materials have been added. 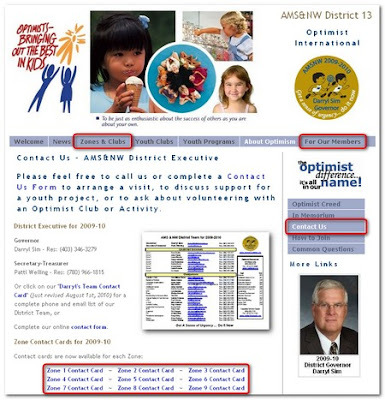 In addition, the "Zones and Clubs" have been updated to match the contact info from the latest version of the District Directory. As a reminder ... Zone Contact Cards are now available. In addition, the District twitter page is now available at twitter.com/AMSNWOptimists. Less than two months left to take advantage of "Free for Four" membership drive. Read about "Tribes" words of wisdom from Seth Grodin and other delightful news for club membership chairs. The 2010 AMS&NW Optimist Junior Golf Championships in Redcliff were a huge success. The parents and kids had a good time and enjoyed the Family BBQ mixer put on by the All Nations Optimist Club on Monday night, as well as the Riverview Golf Club course. The highlight of the tournament was a hole-in-one by Tom Swanson, a 15-year old boy from Missoula, Montana. We lucked out with the weather. It rained a lot on Monday, making a mess of the Practice Rounds. But it cleared up around five o'clock in time for the BBQ. And although Tuesday was cloudy, it never did rain; making it a comfortable day for golfing. I want to thank both the All Nations and the Medicine Hat Optimist Clubs for their help in conducting the District Tournament. I want to again thank the Edmonton-Dinner Optimist Club for their financial support. Colin Gunstream from Missoula won the Boys 16-18 division and was tournament low-score with a 69. Tom Swanson's hole-in-one won him the Boys 14-15 division by one stroke over Huner Anderson from Billings. Katelyn Frank, from Sydney won the Girls 16-18 division and Kortney McNeil won the Girls 10-14 division. The sole winner from outside of Montana was Nolan Mastel from Medicine Hat who won the Boys 12-13 division. We experienced a lower than normal turnout this year. We had 25 young people registered and one of those didn't get his passport soon enough to cross the border and compete. Normally, we get 45-50 contestants from 5 or 6 qualifying tournaments around the District. But this year, both Great Falls and Davidson had to cancel their qualifying tournaments; and neither Saskatoon, Prince Albert, or Bozeman scheduled tournaments. I'll be conducting a workshop about Junior Golf at the District Convention in Bozeman, MT. I hope you and/or someone from your club will be able to attend it. We'll talk about running local qualifying tournaments and ask for your opinions regarding rewarding the winners and runnerups at the District Championships. Our District Convention will be starting in a few weeks in Bozeman, Montana hosted by the Bozeman Optimist Clubs. Meet OI President Mark Shriver and his wife Patricia who are our guests. As Optimist members, we do not often get a chance to meet the president of Optimist International and engage in a conversation on the burning topic that is near and dear to our heart. This would be your chance. Attend Quality Workshops hosted by some of our District Committee Chairs. If you are club president elect or a secretary/treasurer designate, the best training outside of the OI Annual Convention is always provided at the District Annual Convention. If you are an incoming Lieutenant Governor, you get the opportunity to spend an entire day in workshops covering all the information that you’ll need to enjoy a successful year. There is usually a wide assortment of interesting workshops held on Friday for regular members to attend … all provided to enhance your ability to deliver quality, fun-filled projects and programs in your local communities. Meet the Incoming District Team who will be introduced by incoming Governor Tim Bell and sworn into office by OI President Mark. Gov Darryl, Gov-Elect Tim and I are looking forward to seeing you at this year's District convention. AMS & NW members, companions, and children are strongly encouraged to attend the District Convention in Bozeman, Montana from August 19th-21st. The committee members have worked extremely hard to ensure we all have a fantastic time and a program that is 1st rate. Please pass along this message to as many people as you can. 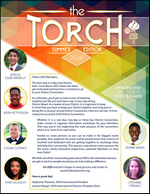 Remember, Optimist International President Mark Shriver and his wife will be our special guests. Let's show them our AMS&NW pride as one of the best Districts in this organization !! We are all looking forward to seeing our Optimist Family come together and have a fantastic convention. Let's make this convention the BEST one ever !! Your attendance is extremely important !! I am pleased to advise everyone that updated editions are now available for the District Directory and Darryl's Team Contact Card. The latest additions include the changes submitted by clubs, and the addition of the contacts for the new East Central Alberta and Penhold and District Optimist Clubs. 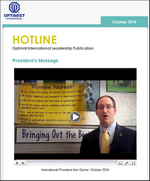 Did you know that there is a new type of Optimist Membership? Become an "eOptimist" ... it's free. Actually there are two types of membership available with different services available. eOptimist is the new generation of Optimist International Members. They are a 501(c)4 nonprofit and share a focus on discovering, sharing and living Optimism with an online community. They have a positive vision for the future because wecombine Optimism and action. And, they support the next generation of Optimism by leading by example – that is, living The Optimist Creed on a daily basis. The St. Albert Breakfast Optimist Club in partnership with the St. Albert Youth Community Centre will be holding a fun night of golf at the Terra Pines Golf & Country Club on Friday evening, September 12, 2010. We hope to raise in excess of $5000 to support the St. Albert Youth Community Centre. Additional funds will be used to finance the many Optimist youth programs that are planned for the coming year. All Optimist golfers are invited to participate and we encourage you to invite any avid golfers that you know who would like to engage in a fun evening of neon golf. See Golfing in the Dark for more details.